Pamukkale is located in southwestern Anatolia, a 4 to 5-hour drive inland from coastal attractions such as Ephesus, Bodrum, Marmaris and Antalya. The closest major attraction is Aphrodisias, roughly halfway between the coast and Pamukkale (less than 2 hours driving). Pamukkale is known as the “Cotton Castle” because of its dramatic travertine terraces formed by hot-spring deposits of calcium carbonate. The Romans built the thriving spa town of Hieropolis here and besides the natural wonders there are some nice ruins to explore. This mystery country is TURKEY. Click to see Turkey tours. 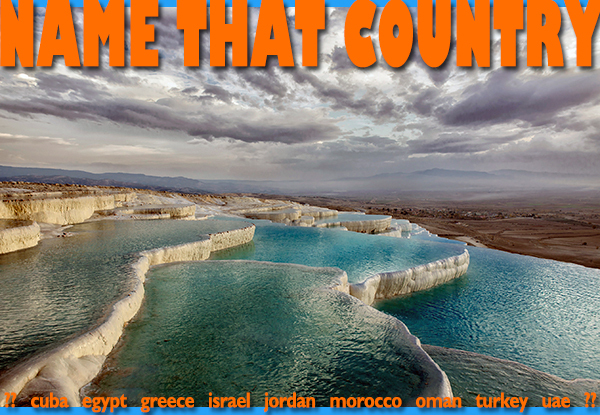 This entry was posted in name that country quiz, Turkey by yalla2013. Bookmark the permalink.